Just as sugary food and drinks can cause tooth decay, acidic food and drinks can cause erosion, the wearing away of the top layer – the enamel – of the tooth. 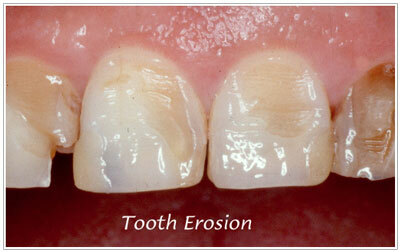 Erosion is very serious as, once the enamel has gone, it’s gone forever. The biggest culprits for erosion are fizzy drinks, fruit juices and squashes as they contain high levels of acid. We recommend that you avoid these and opt for water or milk whenever possible. If you do drink acidic fruit juices or squashes, you can do the following to minimize the damage. If you have any questions about having Erosion, give Dr. Majeed’s Office a call or simply fill in the form below for a quick response.